On Children's Day in Nigeria, a militant group targeting energy groups in the Niger Delta said it would deliver more to the nation's youth than the government, upi.com reports. 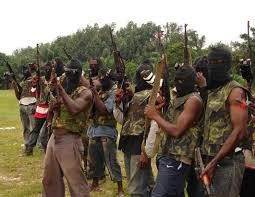 A group calling itself the Niger Delta Avengers said the children of Nigeria have been sidelined by successive Nigeria governments. The group, which has been critical of the Nigerian government's policies in the Niger Delta, said childhood should be a time of opportunity. "This is what the Nigeria government has refused to give you the children of the Niger Delta," spokesman Mudoch Agbinibo said in a statement. "But what they have refused to give to you is what we are promising you." A report from UNICEF finds Nigerian data on children reveal a "shocking" amount of violence. About half of all children in Nigeria are exposed to violence, including sexual violence, at some point in their lives. That data prompted the government in Abuja to declare a year of action meant to end violence against children. The Niger Delta Avengers have launched a steady string of attacks on energy infrastructure in the region, issuing a manifesto earlier this month that warned oil companies the attacks marked only a beginning. The group said it was frustrated by what it saw as a lack of attention to the region paid by Nigerian President Muhammadu Buhari. Nigeria's oil-dependent economy has struggled under the strains that have emerged since crude oil prices first dropped below the $100 per barrel mark in 2014. According to UNICEF, the decline in crude oil prices has hampered the Nigeria economy, pushing public sector salaries lower. "As efforts to restructure the economy away from over-reliance on oil is medium term, the economic situation in 2016 remains bleak," it said.